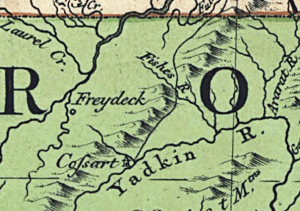 Detail from John Mitchell’s map, showing Freydeck on the New River in NC. 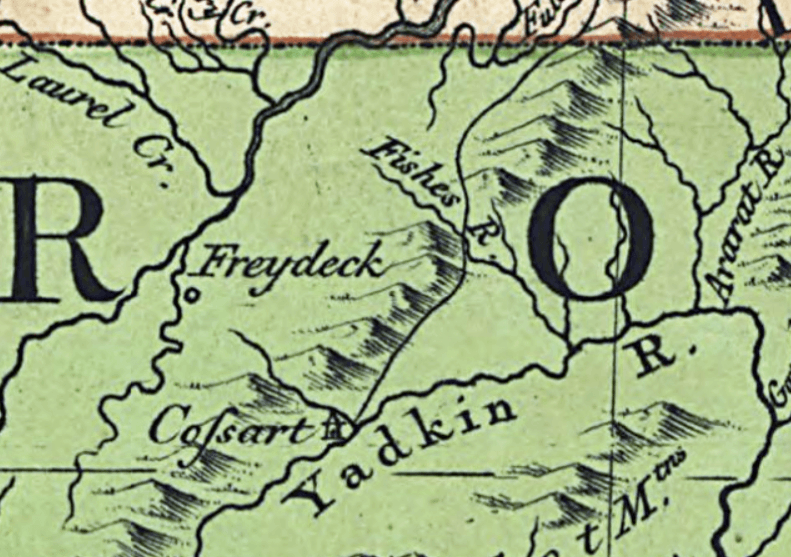 The origin of Freydeck in North Carolina was only two years before it appeared on the most important North American map of the 18th century. Between November 2, 1752, and January 13, 1753, North Carolina surveyor William Churton traveled the back country of North Carolina with Bishop August Gottlieb Spangenberg and several other members of the Unitas Fratrum. Their purpose was to locate and survey an appropriate 100,000 acre tract of land the Moravians were going to purchase from John Carteret, the Earl of Granville. Bishop Spangenberg’s diary provides wonderful details about their adventure. At the conclusion, he offers names for each of the 11 tracts that had been surveyed. I have been thinking that it would be a good thing if the Deeds which we will take from My Lord Granville should contain a name for each tract. I will suggest what seems to me an appropriate name for each, and then leave it to you. …The eighth is across the Blue Mountains, on New River. It is very lonesome, not one man lives there; it is truly a Freydeck (translated elsewhere as “secluded corner”). Other named tracts included Grunen, Merkfied, Schonthal, Richmont, Loesch Creek, Monfort, Oli, Forkland, New Hope, and finally, of course, Wachau. 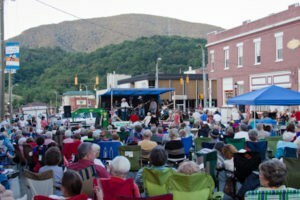 This secluded corner was transformed into Ashe County via an act of the General Assembly in 1799. That same year, the Assembly authorized a $100 purchase of fifty acres to erect the county seat of Jefferson. On the Price-Strother map of 1808 (manuscript completed approximately 1799-1800), the only indication of settlement in present day Ashe County is “A. Smith” on the New River a few miles NE of the eventual location of Jefferson. The Price-Strother map in the North Carolina Collection has a manuscript addition “CH” (Court House) correctly locating the Seat of Ashe County near the head of Naked Creek. This entry was posted in 18th Century, What's in a name? and tagged Churton, Freydeck, Moravians, Spangenberg by crmaps. Bookmark the permalink.